A few months ago, NVIDIA released its next-gen RTX GPUs, with its new ray tracing technology. Not to be outdone, AMD has thrown its counterpunch: the Radeon VII. What is the AMD Radeon VII GPU? The Radeon VII is AMD’s next-gen GPU. It utilizes a 7nm process and is the first GPU in the world to do so. AMD promises that the new process will provide a 25% performance improvement over last generation’s Vega GPUs. The Radeon VII’s Vega core will run at 1,800MHz, about 300MHz quicker than last generation’s Vega 64, which used a 14nm process. In comparison, NVIDIA uses a 12nm process in its 20xx GPUs. However, it’s important to keep in mind that a game’s performance is determined by more than the process size, and every game is built differently. The Radeon VII is also packing 16GB of HBM2; in comparison, the Vega 64 had only 8GB of HBM. It will cost $699 MSRP, aiming to compete with the RTX 2080, which sits at a similar price point. The reference model includes three fans. It’s worth noting that the Radeon VII doesn’t have any ray-tracing cores, but AMD CEO Lisa Su has said that AMD has both hardware and software ray-tracing technology in development. It also supports DirectML, a DLSS-equivalent developed by Microsoft. Given AMD’s prominence in the console space, it’ll be interesting to see if this technology will be picked up in the next-gen XBOX and Playstation. 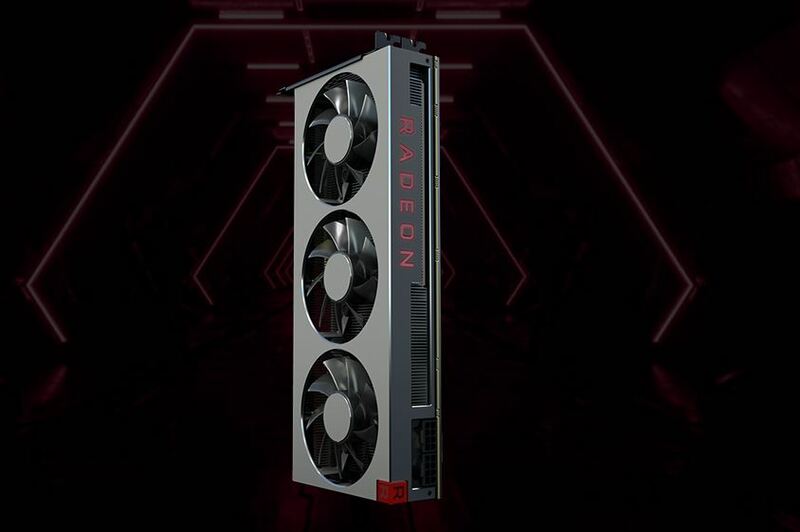 The Radeon VII will also come bundled with vouchers for Devil May Cry V, Resident Evil 2, and The Division 2. If you were planning on picking up these AAA titles, you’re looking at ~$180 worth of savings. When does the Radeon VII release? The Radeon VII is set to launch on February 7, just a few days away. We’ll go hands-on with one here at Newegg Studios soon, and we’ll be checking out how the new card looks and performs in a build.